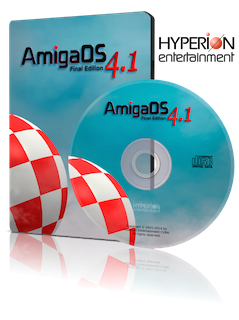 software OS4 : AmigaOS 4.1 Final Edition shipping now! Interested dealers can register themselves and order AmigaOS by writing to orders@hyperion-entertainment.biz. Re: AmigaOS 4.1 Final Edition shipping now! Last edited by amigakit on 20-Dec-2014 at 02:15 PM. Congratulations to all involved! Looking forward to running it!! I can't see the classic version listed on Amigakit's website... and I'm planning to buy Classic and Peg II versions... any comments AK? Last edited by Dragster on 19-Dec-2014 at 01:35 AM. I am sorry, but I would like to see some changelog over update 6. Here is two different machines are used for different tasks and I am not convinced that how much final updates I need - one, two or none. Errors like this in the press release don't really inspire much confidence in the product itself. From: Stad; en d'r is moar ain stad en da's Stad. Makkelk zat! See it as the result of the very (vary...) enthousiasm of the poster, Cyborg, whom has been given the green light and therefore turned 'giddy as a goat on Sunday'. To judge the actual advertised product by it does reek a bit, ehm well, stale to the brink of trolling, but that I admit is a personal perception. I reckon you are not a potential user, but an afficionado of one ,or more for that matter, of the other flavours. Maybe not even an active Amiga user at all. I think a big hurray to all involved would be in place here. Last edited by OldFart on 19-Dec-2014 at 08:45 AM. >See it as the result of the very (vary...) enthousiasm of the poster, Cyborg, whom has been given the green light and therefore turned 'giddy as a goat on Sunday'. To judge the actual advertised product by it does reek a bit, ehm well, stale to the brink of trolling, but that I admit is a personal perception. The misspelling is on the original press release, it wasn't a quoting error. Whenever press releases have such errors it makes people skeptical about the professionalism and error checking procedures of the associated company, for obvious reasons. This applies even outside the IT industry. >Maybe not even an active Amiga user at all. Yeah right, only the programmer of AmiArcadia, Worm Wars, MCE, Report+, etc. Last edited by Minuous on 19-Dec-2014 at 09:13 AM. About the misspelling........ GET A BREAK !!! Decided to wait with the classic version till the emulation gets more memory supported and better GFX card support. I ordered the FE Classic for emulation. I cant be arsed to wait for a pre-configed pack, cause it requires rom and Im not sure how that will pan out regarding legality etc.